The iconic Sopwith Camel, so named for the "hump" over its guns, is possibly the most famous of all First World War aircraft, if not by sight, then by name. Sopwith developed the Camel in late 1916 in an effort to overcome the single gun handicap suffered by their successful 80hp Pup and improve performance with a more powerful engine. The initial Sopwith F.1 Camel prototype was unveiled in late December 1916 and featured a single piece top wing, 2 Vickers Mk.1* machine guns and a 110hp Clerget 9Z engine. Unlike their previous Pup and Triplane, the Camel featured a top wing with no dihedral coupled with a high 5 degree dihedral bottom wing which, combined with its concentrated centre of gravity, helped contribute to it"s high maneuverability and well deserved reputation as a difficult (and frequently dangerous) aircraft to fly. Additional prototypes were produced with various improvements including a 3 piece top wing with centre section cut-out and 130hp Clerget 9B engine. Testing by selected operational pilots in early 1917 brought mostly positive reports along with a few recommendations for additional improvements, some of which made their way on to early production aircraft. The Sopwith F.1 Camel went into production in January 1917 and aircraft began equipping Royal Naval Air Service (RNAS) and Royal Flying Corps (RFC) Squadrons in May and June 1917. Initial problems with performance above 10000ft, mostly attributed to the poor quality of British manufactured 130hp Clerget 9B engines, were troubling and lead to various other engines eventually being used. The RNAS preferred the 150hp AR.1 (Admiralty Rotary 1), later renamed the BR.1 (Bentley Rotary 1), while the RFC preferred the 110hp LeRhone 9J (included in this model) or the improved 140hp Clerget 9Bf when they became available. Many 130hp Clerget 9B engines were upgraded in the field to 140hp 9Bf specifications after a conversion kit was made available in April 1918. The Sopwith Kauper interrupter gear used by Clerget and Bentley powered aircraft proved troublesome but the Constantinesco CC synchronizing gear used by LeRhone powered Camels were relatively trouble free. Other changes included aileron control horn tie wires, re-routing the tailplane control cable exits on the side of the fuselage and a field modified enlarged top wing center section cutout which was incorporated on many late production aircraft. 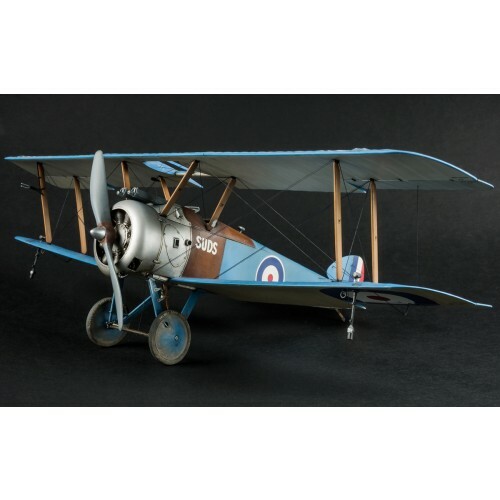 After it"s initial teething problems the Sopwith Camel proved to be a highly capable fighter and, along with the S.E.5a and French SPADs, helped wrest air superiority back from the German Albatros fighters towards the end of 1917. Around 5500 Camels were built by The Sopwith Aviation Company, Ruston Proctor & Co, Boulton & Paul, Clayton & Shuttleworth, Nieuport & General Aircraft, Hooper & Co, Portholme Aerodrome, Marsh Jones & Crib and British Caudron. 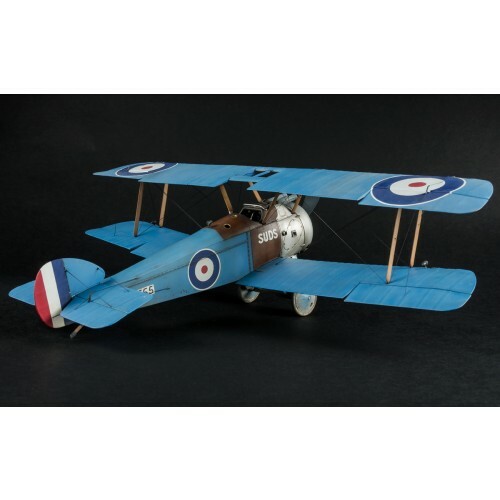 A shipboard version with shorter wingspan and removable rear fuselage was produced for the RNAS as the Sopwith 2F.1 Camel from September 1917. A night fighter conversion with 2 Lewis guns mounted on the top wing and the pilot seated further rearwards was known as the Sopwith F.1/3 "Comic". The USAS arranged to equip 5 squadrons with Camels, many of which were powered by the 160hp Gnome 9N Monosoupape engine. Other nations to use the Camel were Belgium, Estonia, Latvia and Canada. 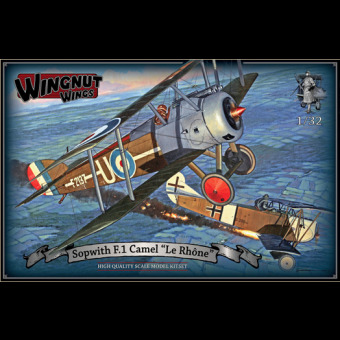 Although rendered obsolete by the arrival of the 230hp Sopwith 7F.1 Snipe in late 1918 the Camel continued to serve though to the Armistice and was not officially declared obsolete by the RAF until late 1919. WW1 aircraft colours are contentious at the best of times and we have done our best to provide what we consider to be accurate painting information. Because Sopwith Camels were manufactured by 9 different companies and Sopwith"s own factory drawings designate both Cellon Scheme A (PC10) and PC12 it is practically impossible to determine which colour a particular aircraft was finished in. PC10 was made from mixes of yellow ochre, iron oxide and lamp black pigments and could vary between olive drab and chocolate brown depending on the mix and time spent exposed to the elements. PC12 is slightly less controversial although previous reports of it being red brown are in error and it was actually a dark chocolate brown. Long serving aircraft were invariably re-doped and repaired with components salvaged from other aircraft resulting in them wearing various combinations of doped finish. Photographic evidence indicates that after trench strafing became commonplace for Camel equipped units in 1918 the upper surfaces of many aircraft were overpainted with a matt camouflage colour that appeared paler than the factory applied dope. Often the white, and sometimes red, of the top wing cockades were overpainted as well. The undersides of the wings, tailplane and often the fuselage were left CDL (Clear Doped Linen). Exterior wooden fuselage panels and cabane & interplane struts were usually given a dark brown varnish, although on some aircraft these were clearly painted. Metal cowlings could be left unpainted aluminium, with a "turned" finish on Sopwith built aircraft, although most were painted. Metal brackets and fittings were black unless overpainted. The early aerofoil metal tube undercarriage struts were usually painted black while the later production fabric wrapped undercarriage struts were almost certainly finished in the same colour as the fuselage. All fabric surfaces exhibited a gloss appearance when new which would lose its shine relatively quickly in service. Unlike many British aircraft, the Camel frequently featured colourful personal and unit markings, although many of the more extreme examples were restricted to aircraft at training units and immediate post war service. Wingspan:	Length:	Max Weight:	Max Speed: (F.1) 28ft (8.53m)	(F.1 Le Rhône) 18.33ft (5.58m) (F.1 Le Rhône 9J) 1422 lb (645kg)	(F.1 Le Rhône 9J) 111mph (178kph) No Manufactured:	Production:	Engine:	Ceiling: 5500 (all types)	January 1917 to 1919	110hp Le Rhône 9J	(Le Rhône 9J) 24000ft (7315m) Armament: 2x .303 (7.7mm) Vickers Mk.1* machine guns & up to 100lb (45kg) of bombs.